They reached the Pacific Sat. after a 4,900 mi. 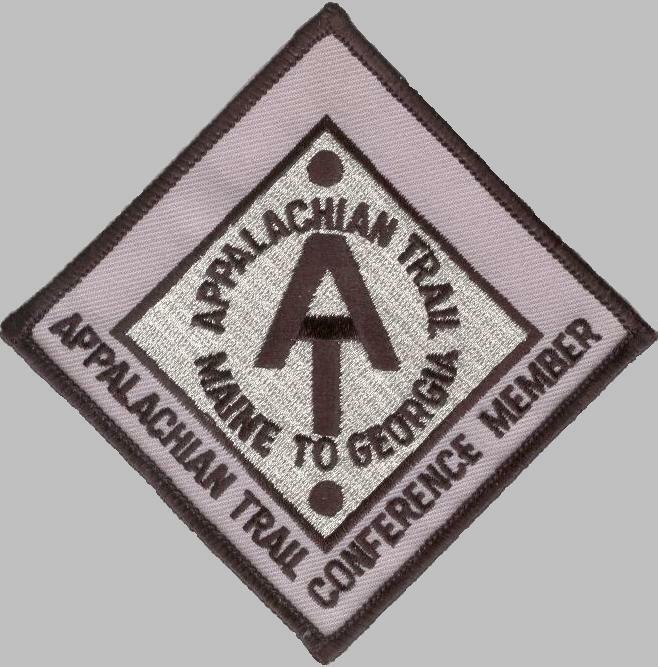 hike, the first to backpack the transcontinental American Discovery Trail in one continuous trek. They started Feb. 27 at Cape Henlopen, DE, and ended at Point Reyes, CA. They're Marcia and Ken Powers of Pleasonton, CA. Please tell me you and Jim aren't gonna try to run it!!" View from Franconia Ridge in the Whites. My sister, Nancy, sent us this e-mail a few days ago, and we got a good laugh out of it. A friend in Montana also sent us a web link to the story. We had already read the whole article in our Sunday paper. Believe it or not, neither of us had ever heard of this trail before! The Powers, a retired couple, have also hiked the Appalachian Trail, the Pacific Crest Trail, and the Continental Divide Trail since 2000, making this story even more remarkable. There aren't a whole lot of folks who have done the "Triple Crown" (AT, PCT, and CDT), let alone ones who are in their 50s or 60s. I replied to Nancy that no, we weren't planning to do this trail . . .
. . . until after the PCT and CDT. 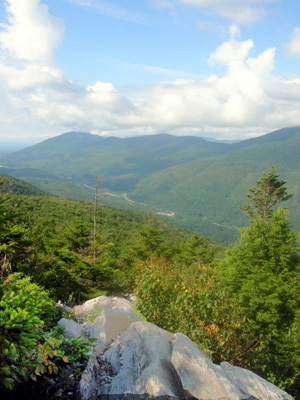 How can anyone choose only ten "most scenic places" along a 2,175-mile trail??? It's not easy, but here are my top picks if you want incredible views on a good-weather day. They are listed south to north, as it's impossible for me to rank them. Most are at higher elevations with expansive views because that's just my bias. I love feeling "on top of the world." Also check Post #10 in a few days for new photos that I haven't shown previously of several of the places below (from my database of over 3,000 photos this summer on the AT)..
1. 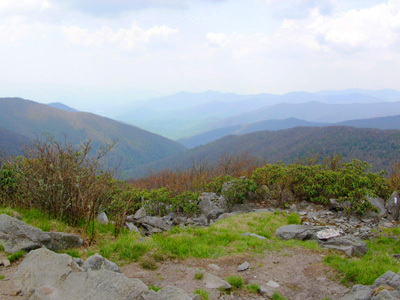 THE SMOKIES, NC/TN - seventy miles of remote trail at the highest elevations along the entire AT. The views are best from the balds (e.g., one in the photo below) south of Clingman's Dome and the other 6,000-foot mountains north-bound on the way to Davenport Gap. Unfortunately, two of the three days I ran/hiked here the magnificent views were obscured by rain and fog. But I know the views are impressive from reports of others who have been there in good weather. See Days 13, 14, 15, and 16 and Post #6 for trail descriptions and other photos of the Great Smoky Mountains National Park. 2. THE SOUTHERN BALDS IN NC, TN, AND VA - The ones I like the best are Max Patch, The Humps, and the balds in Mt. Rogers National Recreational Area and Grayson Highlands State Park. Most are in the 5,000- to 6,000-foot range and have been kept "mowed" by people or grazing animals to preserve the beautiful views of surrounding mountains and lush valleys. Any of these are worthy of a day or section hike. Although you can see farther on a clear day, the mountains are also quite interesting when you're looking down at clouds or fog in the valley below you after a storm. Some of these mountains have interesting rock formations and all are loaded with flowers in the spring. The ones at higher elevations have fragrant pine forests and sub-alpine ecological zones. See Days 18, 27, and 32 for examples of fine Southern balds. 3. 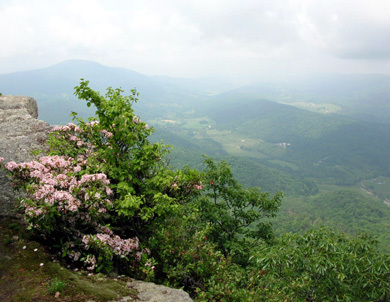 CATAWBA VALLEY, VA - For about thirty miles from Dragon's Tooth north to Daleville, the AT mostly rides the ridges and affords great views down into the Catawba and Roanoke Valleys and Carvin's Cove (a large reservoir). As with most ridges below tree line, the views are more expansive when the leaves are down. But at any time of year on a clear day you can see far and wide from Dragon's Tooth, McAfee Knob, Tinker Cliffs (below), and other high ledges in this section. Yes, I'm prejudiced - we live near here! And these views are one reason why we chose to move here. See Days 42 and 44. 4. 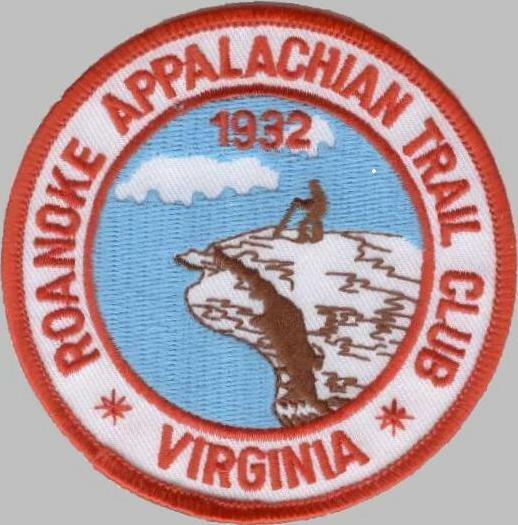 THE SHENANDOAH MOUNTAINS, VA - approximately 100 miles of mostly-runnable trail with the best road access of any comparable section on the entire AT. After the leaves are out there are more views from Skyline Drive than the Trail, but you can still see a lot of great views at pull-outs when the AT crosses the road, from the summit of Blackrock Mountain, and from ledges on Stony Man Mountain, Hawksbill, The Pinnacle, and Mary's Rock. See Days 53, 54, 55, 56, and 57. 5. THE POCHUCK SWAMP, NJ - I threw this one in for a little diversity! The one-mile boardwalk through this beautiful swamp fascinated me with its expansive views of grasses and flowers at eye level and mountains in the background. Although there wasn't much water on Day 92 in the summer it was still close to paradise early on a sunny morning when the temperature was cool. Birds and butterflies were prolific. And if you keep going northbound on the AT you'll soon come to the intriguing puddingstone rock ledges on the mountain above Greenwood Lake near the New Jersey-New York state line. See another photo in Post #4. 6. SAGES RAVINE, CT/MA - there are lots of pretty places along the AT in Connecticut but this was my favorite, another low elevation section of extraordinary scenic beauty. Boisterous Sawmill Branch flows through this cool, deep green ravine for about one-half mile, giving hikers the opportunity to relax by a waterfall or soak in a quiet pool of water. I loved walking through the lush ferns and stately, fragrant pine trees just before crossing the creek into Massachusetts. See Day 100 and Post #3 for photos of this ravine. 7. BAKER PEAK, VT - since I couldn't just put "all of Vermont" here, I chose this mountain as being representative of the beauty I found in this state. Although Baker is less than 3,000 feet tall, the 240-degree view I had to the south, west, and north from the top reminded me of some expansive views I've seen in the Rockies. I loved looking at other nearby pine-covered mountains and large valleys with a patchwork-quilt of farms. See Day 109. 8. 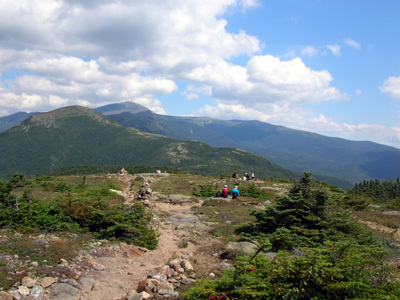 FRANCONIA RIDGE, NH - the mountains in the southern part of the Whites (Little Haystack, Mt. Lincoln, and Mt. Lafayette) have some of the most panoramic views on the entire AT along an exposed two-mile long ridge that is above tree line. I felt like I was in the Rockies. If I was ranking these vistas, this would be my choice for the second-best ridge for scenic views in this list. See Day 118 and at the top of this page for other photos. 9. THE PRESIDENTIAL RANGE, NH - eleven presidents, er, mountains, in nineteen miles, with almost all of the Trail above tree line = better do this on a good-weather day! The views are the best, in my opinion, of the entire AT. I prefer the southern end of the range (Mt. Webster to Mt. Washington) because the Trail is more user-friendly than the boulder piles north of Washington; the photo below is from Mt. Webster. However, the views are downright awesome along the entire range. You'll feel like you're out West, but won't be sucking air nearly as badly. It doesn't get any better than this in the East. See Days 120, 121, and 126. 10. THE BIGELOWS, ME - great views of large lakes and high mountains from Bigelow's four peaks and from Little Bigelow. The Trail is rugged and the elevation gain and loss are substantial, but the views are worth the effort. This area of Maine is chock-full of big and little lakes. On a clear day you can see south to the Presidentials and north to Katahdin.- and beyond. See Day 135. 11. MT. KATAHDIN, ME - OK, I lied. I can't limit myself to just ten "best views." 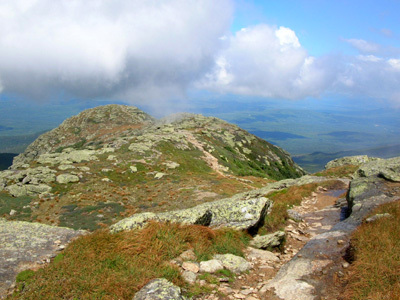 How can I leave out the highest summit in Maine, the point for which I aimed for over four months? 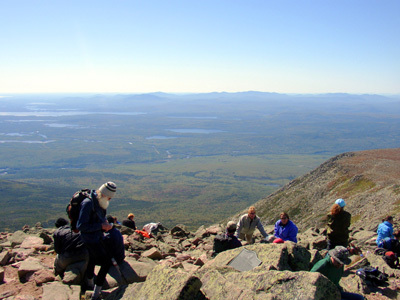 With two thousand feet of the peak above tree line you've got unobstructed views for 40% of the climb up and down Katahdin. On a clear day, you'll think you can see forever. Jim joked that he could see Springer Mountain in Georgia from the top! For certain, you'll see numerous lakes and other mountains and you'll be amply rewarded for the hard work getting up there. 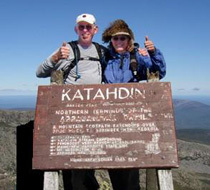 See Day 148 and our page on Katahdin. Writing this entry makes be homesick for these beautiful places. Some are close enough for us to visit again soon. I wonder how long it will be before we can travel again to northern New England?? Next year we are likely to spend quite a bit of time out West at races, so we'll get our "mountain fix" out there. We hope you can visit some of these sections along the Trail and enjoy them as much as we have.